Aging and health research is beneficial for students, businesses that hire them, health regions, policy makers, and most importantly the people of Saskatchewan who we hope will live longer, healthier lives because of gerontological research. Read the Latest CAH Newsletter! The latest CAH newsletter (issue 28) is now available for download. 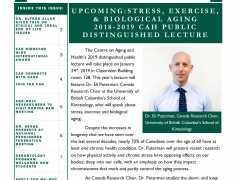 Join us on January 24th for the CAH's annual distinguished lecture. 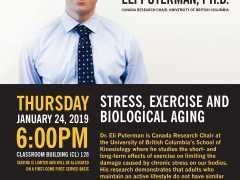 This year's lecture will feature Dr. Eli Puterman. 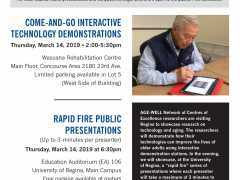 2 Public Events on March 14th, 2019. Events are open to the public. Free admission. Click for details.